Smart Data Recovery Enterprise is despite the Enterprise part of the name a free product that can recover data remotely over a network. 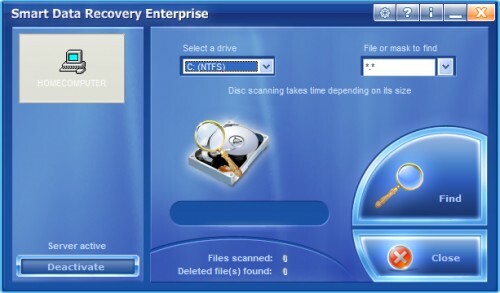 Enterprise hints at the primary application for the data recovery software although I'm a little bit unsure if large companies would rely on free software to recover data. The software can scan remote drives for deleted files, preview those deleted files and eventually recover them. There is obviously the need for a direct connection between the client's computer and the admin which is utilized by a TCP/IP network connection. A software runs on the client computer that initiates the connection to the admin computer. That connection can be initiated manually or automatically. The client PC needs to be accessible because of this. If it cannot boot anymore, you will need to use other software for that. Once the connection is established the administrator can use a graphical user interface to scan one of the local hard drives. A filter can be configured to find only files that match the pattern. You can for instance search for all documents that have 2013 in their name, *2013*. *, Excel spreadsheets *.xls* or other names or file types you are interested in. The remote hard drive is then scanned for deleted files. Everything that gets found will be listed in an Explorer like window. The directory structure is shown in the left pane while the right pane contains the files that have been found. Information about the files are shown as well, most notable the size of the file and an estimation about the chance of recovering the file. Another handy feature is the Wipe button that seems to remove the deleted files permanently from the hard drive. I was not able to find out which algorithm, if any, is used to do that though. Update: Smart Data Recovery Enterprise is no longer available. The company seems to have removed the Enterprise part of the name and is now offering the software for a price. 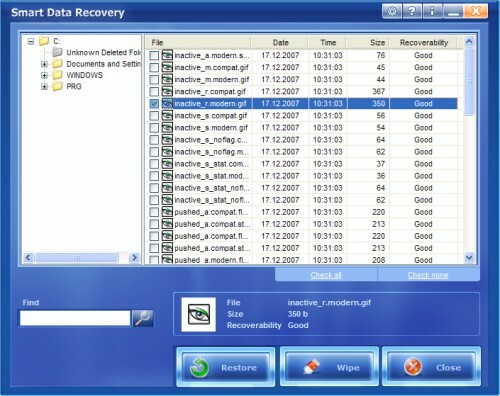 Check out our data recovery category for alternatives instead.